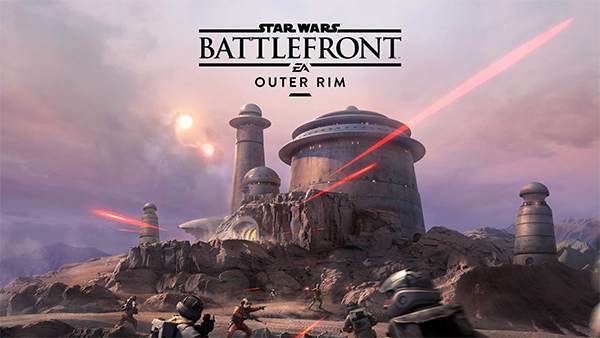 Fight among the factories of Sullust and battle within Jabba the Hutt's palace on Tatooine in the Star Wars Battlefront Outer Rim digital expansion. New Mode: Extraction: Rebel forces have entered some of the most dangerous places in the Outer Rim in order to extract a valuable shipment of resources. Now they must bring the shipment to their transport ship before time runs out. The Empire has arrived to stop them from reaching the extraction point. Explore New Locations: Blast enemies in the smelting factory or along the industrial pipes and platforms of Sullust or fight through Jabba’s throne room and sail barge garage on Tatooine. Become More Powerful on the Battlefront: Arm yourself with the new Relby V-10 rifle and DT-12 blaster pistol and collect and equip the Scatter Gun, Dioxis Grenade, and Adrenaline Stim Star Cards. Play as Iconic Heroes: New playable hero characters will have you shooting first with Greedo or targeting foes with precision as Nien Nunb. Below are the patch notes specific to Xbox One, PlayStation 4, and PC for the Outer Rim Update. Bodyguard: Corrected the Level 3 description from "Decreases explosive damage by a high amount AND blaster damage by a small amount" to "Decreases explosive damage by a medium amount AND blaster damage by a small amount"
Survivalist: Corrected the Level 3 description from "Health regeneration starts much faster AND replenish a small amount of health with each kill" to "Health regeneration starts faster AND replenish a small amount of health with each kill"
Bounty Hunter: Corrected the Level 3 description from "High chance to get a Power-up with each kill AND resets cooldown with each kill" to "Medium chance to get a Power-up with each kill AND current cooldowns decreases with each kill"
Hero Hunt: Redesigned the way in which the new Hero is selected, now the top 3 damage dealers have a chance to be the next Hero - Spin the Wheel! Achievement / Trophey: Updated text of Ackbar's Elite to state "Complete any survival mission on Master without spending a life"